RAVEN PRESS at the University of Delaware was named because of the logo of the just-off-campus bar and landmark in Newark, Delaware. Local legend has it that Edgar Allan Poe had downed a few drinks there. We don't believe the drinking story, but we like telling it. Just for the record, there is another Raven Press so to avoid confusion, we always called it "Raven Press at the University of Delaware." 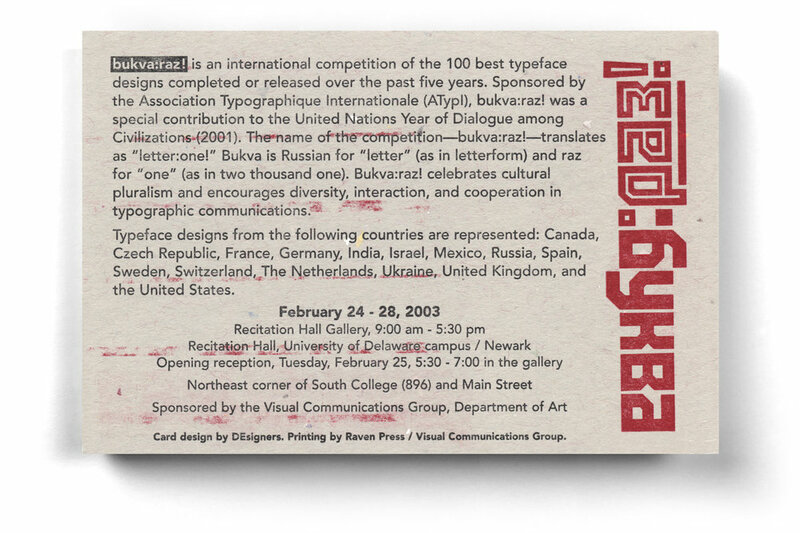 The Visual Communications Group at the University of Delaware hosted an exhibition during February 2003 entitled “bukva:raz!,” an international competition resulting in an exhibition of the 100 best international typeface designs completed or released over the previous five years. Sponsored by the Association Typographique Internationale (ATypI), bukva:raz! was a special contribution to the United Nations Year of Dialogue among Civilizations (2001). The exhibition had been at the United Nations in New York City. Ray called to see if there was any chance we could borrow it to show at Delaware. They said, if we would come and get it, we could just have the exhibition. Our first letterpress project was going to be a 6" x 4" postcard promoting the exhibition. The name of the competition—bukva:raz!—translates as “letter:one!” Bukva is Russian for “letter” (as in letterform) and raz for “one” (as in two thousand one). As the card states, "Bukva:raz! celebrates cultural pluralism and encourages diversity, interaction, and cooperation in typographic communications." Typeface designs from the countries of Canada, Czech Republic, France, Germany, India, Israel, Mexico, Russia, Spain, Sweden, Switzerland, The Netherlands, Ukraine, United Kingdom, and the United States were represented in the exhibition. Getting the exhibition is a story unto itself. If you have the chance to have lunch with us and you say you want to hear the United Nations Bukva:raz! story, we'll give you your choice of Lead Graffiti posters. We love telling the story of running and sliding in the atrium of the U.N., purple hair, and "No you cannot bring scissors and knives in here." We bought our first plates for the 2-color job from Boxcar Press in Syracuse, NY. We had borrowed a brand-new Boxcar base from our only knowledgeable letterpress friend, Mike Kaylor, who handed it over with the explicit directions, "Do not get ink on the plate." We had cleaned our 100-year-old Chandler & Price 10 x 15 press about as much as reasonable people with a new, but dirty, toy would. Raven Press at the University of Delaware was at the starting line. We set up to print the red run first. We cut the press on. Immediately the rollers laid down a solid layer of red, printing to the bottom of the plate and beyond. We cleaned it up as best we could, but there was clearly a pink stain across the whole 9: x 12" base except for the 1" x 4" plate for the red type you can see below. Later we would figure out that the ink rollers were too low, but we were newbies who never suspected such a thing was even possible. To keep the base from being re-inked we put Scotch tape across the whole surface, but the slight change in depth of 2 layers of tape where they overlapped versus 1 was enough to print. We could not figure out how to keep that from happening. So we just let it ink and printed 500 cards. Put a ruler on that red type and you can see it isn't straight, but we were trying to solve the problems one at a time. That red line under "raz" helped balance things out visually, though in no way a deliberate act. Strangely, a lot of people said they loved the antique effect as if it was a design decision, and wanted to know how we achieved it. We accepted all praise, knowing the full truth of the matter. The press which came with a motor that ran at one speed ended up being another problem for us. It was just a bit too fast. We would print 3 postcards and drop one through the press because we just couldn't get it to hit the registration pins correctly very many times in a row. I was feeding the paper and Jill was pulling it out. We looked like clowns. But this was really a fun day at the circus and Raven Press at the University of Delaware was off and running. Just to complete the story this is a photo of our students attending the opening of the Bukva:raz! exhibition. And a photo of Ray with some Cyrillic letterforms.